The use of contactless IR skin thermometry together with Degree2act app will help to improve health and welfare in pigs, since it is no longer necessary to use invasive instruments (such as rectal thermometers), avoiding stress and reducing the chance to produce iatrogenic transmission of pathogens through the thermometer. with temperature alterations and thereby allows for early individual health care and detection of disease outbreaks in the herd, which in turn can help reduce the amount of antibiotics used in health management. Reminder: diagnostics is always under veterinary criterion. Please check here whether your smartphone is compatible. 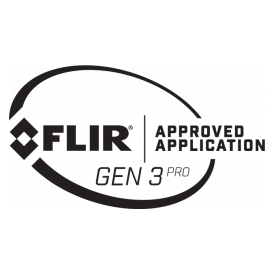 You can, however, use it with any compatible phone and either version of Flir One or Flir One Pro (see here), and we are working hard to achieve optimal results with all available devices. Take a look at the video of Degree2act being used on farms. for an ever more preventive health management - to the benefit of the animals and their owners as well as society at large because it can help to optimize the use of antibiotics. Degree2act interface is user-friendly, custom built for pig farming, it uses complex algorithms based on data obtained through experimental research. Keep in mind that Degree2act improves precision every time you add data. Use Degree2act as much as you can and become a member of our researcher community! Send us your reports and contribute alongside many producers worldwide, to healthier farms everywhere.